The Protestant Reformation, especially the radical version preached by Frenchman John Calvin (ne Jean Cauvin), who set himself up in Geneva, spread to France soon after it began. Calvinism was particularly appealing to the French middle class and nobles. As the nobles were often the chief source of opposition to the Crown, French kings naturally took alarm. In the 1550s the government of Henri II persecuted adherents of the new faith, who came to be called Huguenots, and burned a number of them at the stake. Despite this persecution, Calvinism continued to make inroads, especially in southwestern France. During 1562-1598 France experienced a series of costly religious wars during which the Huguenots established a number of fortified cities, including La Rochelle on the southwestern Atlantic coast. The wars were settled when the Huguenot champion, Henri de Navarre, became king of France as Henri IV. Because the great majority of Frenchmen were still Catholic and because Henri IV wished to secure the Catholic stronghold of Paris, he converted to Catholicism (“Paris is well worth a mass,” he is supposed to have said). To mollify his former coreligionists, he issued the Edict of Nantes in 1598 that granted religious toleration and full civil rights to the Huguenots. The edict also allowed them to fortify some 100 towns where the Huguenot faith was in the majority. Unfortunately for France, Henri IV’s reign was brief; he was stabbed to death in Paris by a religious fanatic in 1610. His son, Louis XIII (r. 1610-1643), was then only nine years old. Louis grew up to be weak and indecisive, but he had a capable chief minister in Armand Jean du Plessis, Cardinal de Richelieu, who was the virtual ruler of France during 1624-1642. This born administrator made raison d’etat (reason of state) the dominant consideration in all his policies. Although he was a sincere Catholic, Richelieu never let religion get in the way of strengthening the state. To Richelieu, the Huguenot-fortified towns formed a state within a state and were thus unacceptable. Alarmed by Richelieu’s stance, the Huguenots rebelled under the leadership of the dukes de Rohan and Soubise. Richelieu responded by declaring the suppression of the rebellion his first priority in 1625. Protestant, rich, and looking toward England, La Rochelle relished its independence. The city itself lay at the end of a channel. Off it were two islands: the closest, Ile de Re, and the more distant Ile d’Oleron. La Rochelle was the strongest of the Huguenot fortresses and the center of resistance to royal rule. In 1626 La Rochelle had been forced to accept a royal commissioner, to agree not to arm its ships, and to accord full rights to Catholics. In March 1627 France formed an alliance with Spain that solidified its position. Six months later Richelieu’s forces initiated a siege of the city and exchanged artillery fire with its Huguenot defenders. Because La Rochelle was a port it could receive aid by sea, and in June 1627 King Charles I of England sent 120 ships and 6,000 soldiers there under his favorite, George Villiers, Duke of Buckingham. The English fleet arrived at Ile de Re on July 10. If the people of La Rochelle welcomed the troops, Buckingham was to place them under command of the Duc de Soubise, who arrived with him. If not, the men would return to England. Soubise went to La Rochelle to negotiate with its leaders, but they feared the consequences of welcoming English troops. Buckingham therefore ordered his men ashore to secure Fort St. Martin on Ile de Re, which was controlled by the royalists, as a base for future operations. His men, most of whom had been pressed, were poorly trained, and many refused to go ashore. 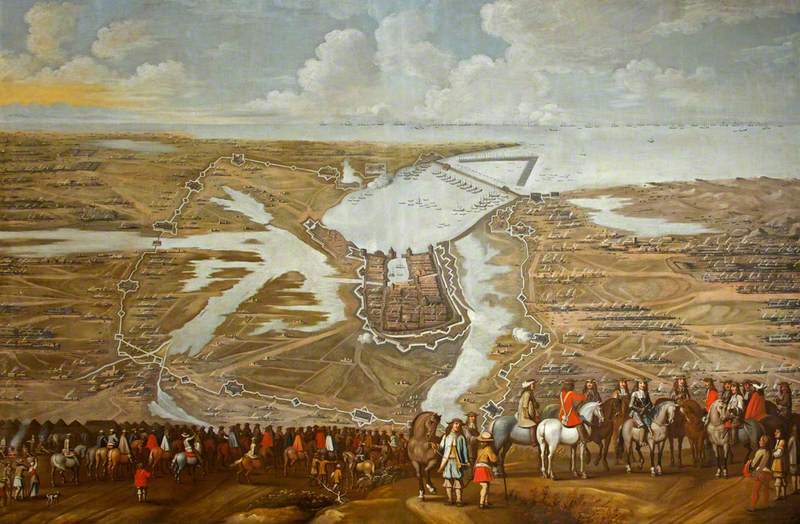 Others bolted on the first gunfire with the royal garrison on the island. Buckingham was thus unable to take the fort; instead, he resorted to a blockade. Richelieu was certain that if Buckingham took Fort St. Martin, his siege operation would fail. Richelieu therefore sent French ships to supply the fort, called up feudal levies, and sent about 20,000 men toward La Rochelle. The brother of the king, Gaston d’Orleans, had nominal command, but field command was held by the Duc d’Angouleme. As it worked out, Richelieu actually retained direction of affairs. In August, Angouleme closed off the city from the land side, and the city fathers voted to call on Buckingham for arms and assistance. The royal garrison on the Ile de Re continued to hold out, although on October 1 its commander, Jean de St. Bonnet de Toiras, sent word that his men were almost out of food and that without relief he would have to surrender on the evening of October 8. Therefore, on the night of October 7 Richelieu sent a relief force of 47 vessels under an adventurer named Beaulieu-Persac. That night a battle took place off Ile de Re between the French and English warships. Although he was eventually forced to surrender, Beaulieu-Persac succeeded in distracting the English long enough for his 29 supply ships to beach themselves on the island. A few days later King Louis XIII arrived in the vicinity of La Rochelle. Richelieu then personally led 9,000 reinforcements to the Ile de Re and Ile d’Oleron from northern French mainland ports. Running short of supplies himself, in desperation Buckingham and 2,000 men launched a last attempt to storm Fort St. Martin on November 5. The English took the outer works but were then driven back and shortly thereafter came under heavy attack from the French relief force. On November 8 Buckingham sailed away with the half of his force that remained. With Ile de Re secure, Richelieu could concentrate on La Rochelle. In November the French constructed a powerful siege line more than seven miles long with 11 forts and 18 redoubts. The French lacked the means to blockade the city completely from the sea, but after reading how Alexander the Great had built a great causeway to end the siege of Tyre, Richelieu ordered construction of a great stone dike at the end of the bay to close La Rochelle off from the sea. Jean de Thirot, architect to the king, and Clement Metezeau, the king’s master builder, had charge of construction. Work began in October and for all practical purposes was complete by January 1628, with the jetty and 56 ships chained together and armed to form a floating wall. In addition, Richelieu assembled 36 galleys and pinnaces in the roadstead to attack any expedition launched from La Rochelle to destroy the dike. In March an English ship made it to La Rochelle with supplies and promised assistance from Charles I. The people of La Rochelle took heart and elected Jean Guiton as mayor. He infused new life in the defense. Moreover, in early May an English fleet under Lord Denbigh arrived. The English ships briefly bombarded the dike but without effect. Then, learning that a Spanish fleet was at sea, Denbigh sailed away on May 18. On September 28 a larger English fleet under Count Lindsey appeared off the dike, transporting 11 regiments and food for many months, but the troops were disaffected, and it departed without landing either men or supplies. With this final disappointment and virtually no hope of resupply, on October 29 the La Rochelle garrison finally surrendered. During the siege, largely as the consequence of famine and disease, the population of the city went from 27,000 to only 5,000 people. 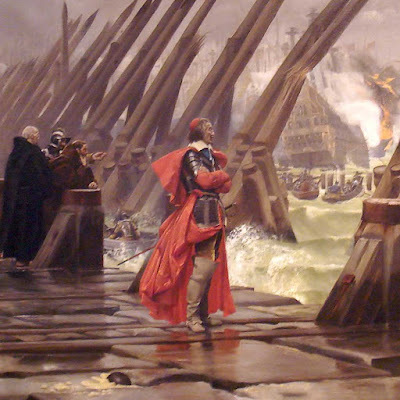 Richelieu entered the city in triumph, and French troops immediately began the destruction of La Rochelle’s walls and fortifications. Richelieu then amended the Edict of Nantes in the Peace of Alais, which formally ended the siege. The Huguenots lost the right to maintain fortified towns and military formations independent of the Crown. They did, however, retain full religious and civil rights until 1685, when King Louis XIV, much to the detriment of his kingdom, annulled the Edict of Nantes altogether. One reason the siege had taken so long was that France did not have much of a navy. Richelieu may be regarded as the father of the French Navy, for he ordered construction of a force of 38 warships for the Atlantic and 10 for the Mediterranean. Holt, Mack P. The French Wars of Religion, 1562-1629. Cambridge: Cambridge University Press, 1995. O’Connell, D. P. Richelieu. New York: World Publishing, 1968. Sutherland, N. M. The Huguenot Struggle for Recognition. New Haven, CT: Yale University Press, 1980. Wood, James B. The Army of the King: Warfare, Soldiers, and Society during the Wars of Religion in France, 1562-1676. Cambridge: Cambridge University Press, 1996.